There will be a couple of loosely associated Purple events held next week in Warsaw, Poland. 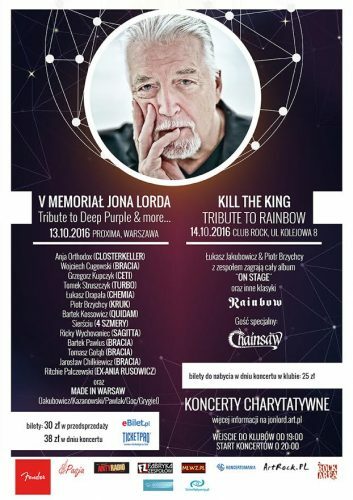 The Jon Lord Memorial Concert will happen on Thursday, October 13, at Proxima Club. Seeing as this is the fifth such occasion happening annually since 2012, it can safely be chalked as a good tradition (this tradition is the brainchild of Polish musician Łukasz Jakubowicz). The house band Made in Warsaw (with Łukasz on keyboards) will perform with an array of guest musicians from the local bands. The 3+ hours program will include big hits and obscure numbers from Deep Purple and Whitesnake. Advance tickets can be purchased online @ ticketpro.pl, ebilet.pl, eventim.pl, palladium.art.pl, and offline at Bileteria Palladium (ul. Złota 9 Warszawa), Bileterie Empik, Media Markt and Saturn stores. The second event — Kill the King — a tribute to the late Cozy Powell, Ronnie James Dio, and Jimmy Bain, will be held next day at Club Rock. A tribute band (with Łukasz Jakubowicz once again at the keyboards) will perform Rainbow On Stage from start to finish. Piotr Brzychcy will do the guitar duties. Thanks to Łukasz Jakubowicz for the info. Posted by Nick Soveiko on Saturday, October 8th, 2016, filed under Blog. You can follow comment on this post through the RSS 2.0 feed. You can skip to the end and leave a comment. Pinging is currently not allowed. This sounds like a lot of fun for the lucky attendees!.